What a thoughtful post. I teach grade 1 and would love to take this approach. When we talk about apologizing I remind the kids that the answer to I'm sorry is not it's OK but instead to thank them for their apology. This is a better way yet to get kids to talk it out, a big piece of our approach to problem solving. Thank you so much for sharing. Thanks for the comment, Christina. I'm so glad you found the post thought provoking. I really admire your approach as well - especially your point about not always having to accept an apology, but saying thank you for one. Very important! 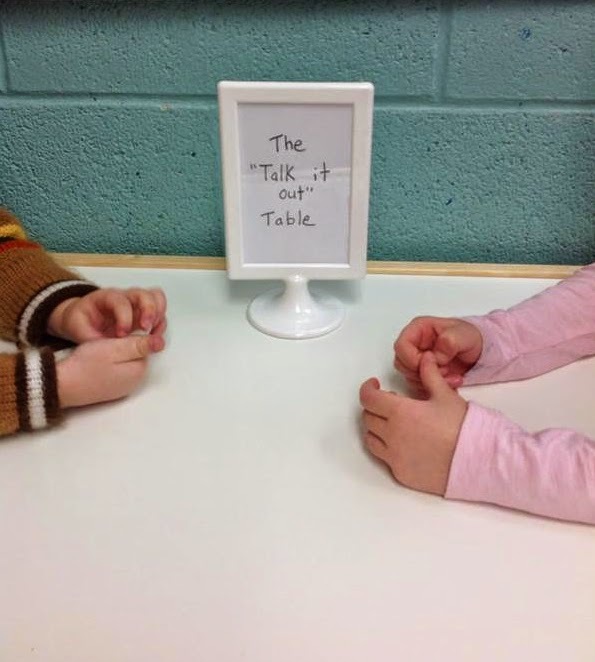 I love the idea of a talk it out table. I plan to use it with my 3/4 class! Thanks for posting about this! Glad to hear you found the idea inspiring, Laura! Be sure to keep us posted - I would love to hear about how it works in an older grade.